Women’s Footy: A league of their own? I’m writing this from afar, so will happily stand corrected if I have any details wrong. Though, when in Australia, I phoned the AFL seeking more information about the proposed women’s national league, and was transferred to a voice mail, message unreturned. Perhaps they weren’t ready to answer questions yet. As I understand it, the women’s competition will be affiliated with AFL clubs and be under the umbrella of those administrations. To what extent they will be exact AFL replicas I’m uncertain about – wearing similar jumpers, same mascots etc – but I’m assuming they will be the same, or close to it. As much as I’d love to see a team of female felines (if Geelong was granted a licence), I can’t help wondering if it would be even better to have a national women’s league independent of the AFL, with its own clubs, team colours and nick names (hopefully ones more original and less American-copies than ‘Suns’ and ‘Giants’) and administered by women (though, doesn’t have to be gender apartheid). They would be responsible for their own marketing, sponsorships, salary caps and player payments etc. While AFL initiatives, like Auskick, played a huge part in raising the skills and participation levels of girls in footy, that doesn’t preclude women from running an independent national competition. The AFL can play a mentoring role in assisting the set-up, but keep a distance other than providing the overseeing role it plays in regard to all leagues. Women now run their own game to a large extent with netball, and while an offshoot of basketball it was invented by a woman for women. This comparison is only partly accurate, because I’m not suggesting a modified code or a completely different game to Aussie Rules, but it is an example of women putting on their own show (female footy does, though, as it spreads, have implications for netball’s future given many teams are linked, in their own individual way, with Aussie Rules clubs). And of course, there was the American women’s baseball league that inspired a movie, which this post’s title references. That competition was established during the Second World War due to a male participation vacuum, but also showed what is possible. Times have changed so much since in regard to gender roles that an independent, national women’s Aussie Rules league shouldn’t be seen as revolutionary. I have to confess to some ignorance about current female footy leagues and how they are already administered gender-wise, or for that matter, coached. But the below link reveals a long history of women’s footy in Australia and overseas. A crowd of 2500 in Vancouver in 2007? 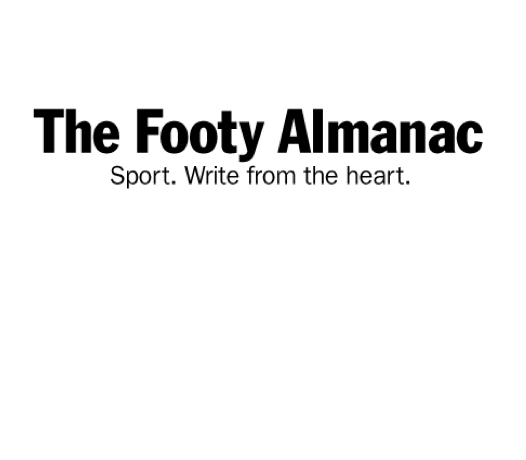 Callum O’Connor has also written Almanac articles about women’s footy. A recent Age piece by Samantha Lane revealed that the AFL-affiliated women’s league will trial several modified rules in a pre-season comp, including 15 minute quarters, and ‘last touch’. When the AFL introduces temporary rule changes like this it makes me uneasy it has an eye on their possible insertion into the main comp. It has history in that regard and a never-ending desire to tinker. Will it use a women’s national comp as an ongoing excuse to experiment? It was interesting to read the women’s VFL competition still has 25 minute quarters. Maybe they can teach the men something. Being under the AFL umbrella, affiliated with established clubs provides a ready-made structure and all its benefits of marketing and large supporter bases. The AFL also, no doubt, sees affiliation as most promoting the code and itself (and as being least likely to splinter support?). Affiliation is the safe option, but is it the best one? There is more risk in going it alone, but also potential reward. Presumably many female players barrack for AFL teams and would like the chance to represent them. What do they really want? At present they are, to a large extent, dependent on what the AFL offers. Countering that, the AFL needs a women’s league because opposition codes have them and risk stealing market share. While I’m not opposed to giving the AFL a back-hander, I also acknowledged it is often damned whatever position it takes, and has many competing interests to try and satisfy. It has done, and is doing, a lot to encourage female participation in Aussie Rules, and has exhaustive guidelines to make their involvement easier. To be honest, from a selfish perspective I would like to see the women’s comp aligned with AFL clubs, especially if one of the teams was linked with the Cats (even if it might inspire reinvention of handbag tags). And I generally prefer to see men and women working together rather than being in different camps. AFL crowds are of such mixed gender it would seem a natural progression to be affiliated, but how that will work in practice is unknown – will the women’s matches be curtain raisers or held separately or a bit of both? Then again, an independent league doesn’t necessarily exclude match involvement with the AFL for cross-promotional purposes. In many ways, this is a gender-political question. What sort of equality do women want? Gender politics will emerge in an affiliated scenario as women seek equality within the AFL club structure with likely disputes regarding payments, conditions, and issues about sexism. Women running an independent competition helps mitigate those disputes, because the gender-politics is played out in the formation of their own league – they then become responsible for their own outcomes. Anyway, this is by no means an exhaustive analysis. Maybe some will argue that women’s footy has come a long way in a short space of time and this is simply another small step until the future day women break away and form their own league. Others might claim an independent league won’t draw an audience and will fall at the first hurdle. While crowd numbers could be low there is already broadcast interest in women’s footy, and I suspect that would remain either way. More important, is how they play the game. Corrupting that, affiliation could mean a women’s comp cursed by AFL coaches with negative tactics like tempo footy (it often seems these days that if you want to see a game of pure, instinctive footy you’re more likely to find it at suburban, country or junior level). Some might say that an independent league will be overlooked by the media like all women’s sports. I consider the assertion female sport is overlooked to be a simplistic claim, anyway. Which sport? Where woman have effectively competed at the top level as long as men the coverage is typically equal – swimming, tennis and athletics, any Olympic sport, for example. In the case of gymnastics, female competitors have often received more publicity. The sport that has been most justified in airing coverage complaints is netball given its participation rates and length of competition. I doubt the same will apply with an independent national women’s footy league because of the overall popularity of the sport and the number of female followers. There’s little debate, though, that an affiliated league will receive more coverage because of the aforementioned ready-made structures and loyalties. It is risky, even foolhardy, some may say, for a bloke to stick his nose into gender politics. It might help if I could draw a conclusion, but one is yet to emerge, and probably won’t until more details do. As a fan, I prefer affiliation. From a gender-political perspective I side with an independent league.